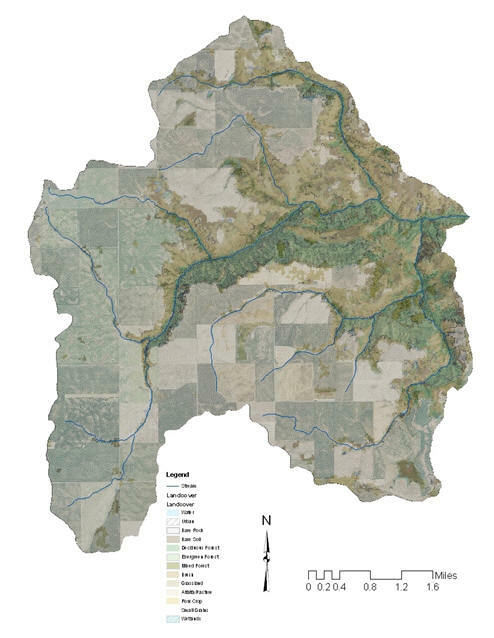 Sixmile Creek Watershed (15,805 acres) is located in Lewis County and entirely within the Nez Perce Reservation. The stream flows in an easterly direction approximately 8.15 miles to its confluence with the Clearwater River approximately 6 miles downstream from the town of Kamiah. Elevations range from 1,119 feet at the mouth to 3,330 feet in the uplands. Effie Creek, the only major tributary, flows into the mainstem about 0.5 mile from the mouth. The dominant land use in Six Mile Creek watershed is agriculture (99% cropland). The watershed contains steelhead/rainbow trout, speckled dace, and piute sculpin. Densities of young of the year steelhead/rainbow at stream mile 3.9 ranked second among Reservation streams sampled by Kucera (1984), indicating substantial natural reproduction. Sparse riparian vegetation, variable annual flows, low summer flows, siltation, and high in stream summer temperatures were identified in early studies as impacting the water quality (Kucera 1983, and Fuller 1985). Recent Sixmile Creek stream survey data (NPT 2005) for one reach–188 meters– indicate suboptimal conditions for: width/depth ratios, stream bank stability, cobble embeddedness, large woody debris, and pool frequency. Roads and logging activities were identified as contributing to the siltation problems (Kucera 1983, and Fuller 1985). Agriculture is also a source of nonpoint pollution in the watershed.